I agree with most of the content of this thread. Furthermore, what really disturbs me is how little information we get from Xamarin. We don't really know what's going. It's fine to be badly sick as long as you know how long it will take you to heal. But here we don't even get chance to hear to nurse tell us "don't worry, all will be fine" from times to times. And… please release finally an usable VS integration SW that is worth the name “Stable”! I have to update my Android app and am not able to do it, as the evergreen-bug (file is in use by another process) is back, after I had to update my version to 3.11.836 for iOS9 support. I’m blocked in my work right now once again! ... put together all “information-snippets”, check his installed SW-versions and all links in the thread to see, that… his problem is not described…?!? I (really!) can’t understand that! I'm a moderator, and I can see no evidence that anything has been done to this thread to hide it. Also, if I search for "how to make stable" it's the top result. I don't think anything nefarious is going on. The off-the-shelf forum software that Xamarin is using probably has some heuristics for determining when an old but active thread should no longer jump to the top. Take off your tin-foil hats. @adamkemp how about a little respect to start with, great to have a representative of Xamarin clowning us when we are talking about serious issues with a product we pay a substantial sum to use. If you look at the attached screen capture, your comment was at 10:32 my time and should have fallen between the top two posts 10:33 and 10:25. That is what we are questioning. We are not crack pots spouting conspiracy theories, we are developers who have bet our lively hoods on Xamarin and Xamarin Forms and are voicing real concerns about the software. If our comments were unfounded then why did this thread cause Xamarin executives to take notice? If you're not able to help the discussion, please keep your insults to yourself. That's not the problem (searching). The only reason why I even knew this thread was active is because its in my favorites. I've been a very active spectator to this thread and looking forward to some well deserved feedback and insight. I don't work for Xamarin, and I didn't say your comments were unfounded. I'm just saying that I see no evidence that this thread is being hidden in any way. I actually do believe this is either a bug in the forum or, more likely, the way the forum software deliberately behaves with old but still active posts. Why attribute malice to it? That's too cynical for me. I wouldn't be surprised if Xamarin was purposely hiding this thread, but it might also be a forum feature as indicated above. Who knows.. but thank you all for keeping it active with new posts. I myself want a stable version that works with VS2015 and I'd love to hear more news on UWP support. Again, I'm a moderator, and if that had been done I could see it. When I look at this thread I can see that it is not marked as sunk. As far as I can tell this wasn't done. Unless there's some other feature that is invisible to moderators then there's nothing going on here. @MigueldeIcaza (and all other readers of this thread). there are some good news. As Xamarin has grown, it has become increasingly important for our customers that every release of Xamarin be enterprise-grade: stable and high-quality. This addresses one of the major problems, that all iOS-developers have (the actual integration SW extremely hurts the productivity of all iOS-developers). If the new version really works as expected and we really all "will love it" (like you wrote), this is a big step in the right direction. The second major problem is the stability of .Forms (especially new bugs in new versions and "evergreens" (bug's that were solved and pops up again in newer versions). So... I hope, that the new "release candidate process" also will take place for .Forms and we all can expect "enterpris-grade: stable and high-quality .Forms versions for the future. The target is, that users that have tested the new version, post their findings there. Thanks for creating that thread. I've posted my feedback there. We still don’t have a stable .Forms. We still have to test our app with every new .forms release and see, which bug’s (maybe) has gone, which new bugs occurs and which “evergreens” have returned. I have took the time to do a new Bugzilla query (all .forms bugs). Every count is higher now. O.K. we now have the “Like” visible - (really) thanks for that - and a “Question” link, that - unfortunately - is not really usable as we are not able to filter and all forum questions are showed scrambled. Instead of make .forms stable and add (since the start missing functionality) for the existing paying customers, new paying customers should be acquired with a “new” 2.0 version that don’t really bring any enhancement. Instead of enhance the communication (like promised also in this thread), the new 2.0 was simply put on nugget (in the stable-channel) without any pre-information in the forums to the users. Each customer has/had to note this himself, wonder and float the forum with questions to V2 (V4)! Instead, we receive a plain marketing-mail without any useful information (“Better, faster, and more productive”) to the “new” version 4 with advertising to the Xamarin test-cloud and insights. This is definitely the wrong way, Xamarin ! I couldn't agree more. As usual the Forms users are taken for granted and 2.0 is pushed out for PR purposes. Also their pricing for Insights is a joke. Not touching 2.0. Really fed up with Xamarin for several reasons today. @FredyWenger / @NMackay, I feel you both. I find it appalling that devs are generally defending Xamarin for whatever announcement they make and make you feel that it's ready for production use without having to contact Xamarin only to find out that it's a bug. Xamarin.Forms -> Massive marketing push to use it by evangelists, blogs, Xamarin University and documentation. And yet, I still don't think it's production ready. Visual Studio plugin -> Pay more than 3x, only to find out that you can't use it reliably. You'll end up bouncing back and for between Xamarin Studio and VS. Less features too. (No wonder, unless showing off VS feature or for marketing, all blogs and Xamarin University training are demoed using Xamarin Studio. Heck, I don't think a single Xamarin employee even used Visual Studio on a daily basis.) I just think it's a bait and switch feature. For a software company that's charging so much, I'm expecting more from them to deliver a stable platform where you don't face daily trivial issues that end up as a bug. The daily life of switching to alpha, beta, stable releases to figure out if your code or Xamarin's. This community should speak up more, so that Xamarin will wake up that we don't need the marketing hoopla's about them gaining new enterprise partners and delivering a new version but really same stability. I'm afraid I'm of the same opinion here. It's very cynical for Xamarin to announce Forms 2.0 with so many outstanding bugs, so few new features, so little interaction with their user base and practically no real information about it. It's hard not to feel superfluous at this point - I feel like many of us have no voice whatsoever. As far as I can tell they are doing very little to address problems many of us raised 6 months ago. I have no idea how to make them focus more on real current developers, and assist us to make great apps which will grow the platform. All of this artificial growth they keep pursuing is just going to lead to more disgruntled developers, and that is not going to lead to a healthy eco-system. I've been following this thread for some time and just want to add my voice of frustration. I frequently hesitate to get more involved in the discussion as I am a fairly amateur developer (I've been developing for close to 2 years without any formal training). I feel I don't have the same ability to articulate my issues as it takes me a while to ascertain what the problem actually is. I don't have any previous experience filing bug reports so I will admit that I (and perhaps other frustrated users) could and should be more vocal/proactive about the problem here in Xamarin land. Thank you @FredyWenger, @NMackay, and @GeorgeCook (and all others) for all the thought and work you guys are regularly exerting to make our lives less painful. It's really appreciated. I was disheartened to see the announcement for Xamarin 4 with no mention of Xamarin.Forms improvements. A lot of the changes seems to give you a taste of their additional products (Test Cloud, Xamarin University, and the introduction of Xamarin Ultimate). It's seems like there are steering us to become more invested, though the heart of the Xamarin Solution (Xamarin.Forms) is not stable. It feels manipulative and vapid. But there isn't a whole lot of information available so perhaps there is some good stuff on the way. Much of @FredyWenger suggested solutions (going back several months) to Xamarin communication seems extremely relevant. His and our frustration with Xamarin.Forms is alive and in the fore-front of my mind every day I come to work––hoping to not waste the day away dealing with Xamarin issues. I will continue to post to this thread if/when I can offer something substantial. And I will make a better attempt at following up with bug reports. Asking the guys who are at the forefront of our cause here, what else can we be doing to speak up? @Smaths thanks for your thoughtful and poignant comment. I'm sure Fredy will add more; but you should certainly let your account representative at Xamarin know. Perhaps if we see enough people happy to voice their concerns, then we could think of some other way to assist Xamarin in supporting their paying users. One note, is that you can probably kiss your MVP possibilities goodbye by speaking up about this stuff, which is likely why some of the more informed voices in the community always ignore or downplay the issues. I can't see that being tenable though over-time, the whole Forms community suffers with Xamarin's current approach to engaging the developer community, which as you say is vapid and marketing focused. I'm sure Fredy will add more; but you should certainly let your account representative at Xamarin know. Ok that makes a lot of sense. I'm going to reach out in the very near future with some organized criticisms. I'm not sure how useful it would be, but perhaps putting together a rough template for a "Xamarin.Forms Stability Concerns" email would encourage other users who have not reached out to do so––make it easier to do so. I'm not sure that is a great approach as it may contain recycled material in the emails but I'm trying to think of ways to make it easier for users to voice their frustration. I can offer a draft when I've put mine together. One note, is that you can probably kiss your MVP possibilities goodbye by speaking up about this stuff, which is likely why some of the more informed voices in the community always ignore or downplay the issues. @GeorgeCook I've seen this MVP status around but I don't know what it indicates. Xamarin unofficially approves of you work? You teach xamarin courses? Could you briefly explain? I'm not sure where this fear comes from. I've been vocally criticizing Xamarin.Forms in various ways for a long time. I happen to think that the sentiments in this thread are overblown (flame me if you want for that), but that has nothing to do with any fear of losing my MVP status or blind allegiance to Xamarin. I just honestly disagree. For instance, Fredy likes to point to the bug count in bugzilla, but that's not a valid way of tracking stability. There are too many confounding factors. For instance, how many of those bugs existed previously but were only recently reported? How many bugs are reported and fixed privately that you never see? Was there a push to report more bugs publicly recently, which would inflate the numbers? What's the severity of those bugs, and how many users do they affect? If you want to use defect metrics to measure quality you have to put a lot more thought into it than simply comparing a single total number. That analysis has clearly not been done here. I've seen this MVP status around but I don't know what it indicates. Xamarin unofficially approves of you work? You teach xamarin courses? Could you briefly explain? Xamarin MVPs (listed here) are non-Xamarin developers that have been recognized by Xamarin for their contributions to the Xamarin community. There are a few minor perks, but primarily it's just a public recognition of good deeds. I happen to think that the sentiments in this thread are overblown (flame me if you want for that), but that has nothing to do with any fear of losing my MVP status or blind allegiance to Xamarin. I just honestly disagree. Can you elaborate on which sentiments are overblown? Are you satisfied with the stability of Forms and the communication from Xamarin? @FredyWenger suggestions read as reasonable approaches to solving existing issues, at least great places to start a meaningful conversation. Not flaming––trying to wrap my head around it all. Yes and No, I feel somewhat cheated after paying several thousand euro's (Business Licenses, University etc.) to come to the same conclusion as Mark about the Visual Studio plugin. Could have bought the most expensive MacBook instead of the entry model from the savings. Stability is an issue but I have a greater problem with how releases are managed (Stable versions with a higher version number as the Beta), no release dates etc. on the Current Release page and basically no way to create a stable working environment. Not very enterprise minded. It gives me some bad signs about a club of enthusiasts that ship products in an uncoordinated way to solve the most critical customer of that day his/her problem. Having said all this I recognize that I make my living at this moment using a product that shows great promise and somehow delivers a lot no matter what problems. And let's be honest: a lot of the problems come from lack of quality from other players like Apple (never seen an update rate like with xcode for something so critical), Android (en their 15.000plus different versions). Last but not least: the numbers Freddy totaled are useful but what worries me is the total number of 'Need info' that could very well be a lot off questions that are coming from poor understanding of the product or platform (I know I at least entered one that turned out not to be a Xamarin problem). Comes with the growth I assume. But it takes it toll on the service-desk as everyone expects an answer. That's overblown, for one. Forms is stable for some uses. One of the fundamental disconnects between Xamarin and some developers in the community is what Xamarin.Forms should be used for. Xamarin has tried to position Forms as a solution for simple enterprise/forms-based applications and proofs of concept, two use cases for which it is actually pretty reliable. On the other hand, some in the community see a lot of potential in Xamarin.Forms as a solution to much more complex applications, and they are pushing the limits of what it can do (a noble goal, for sure). The problem is that this exposes some rough edges that were not necessarily meant to be exposed. Custom renderers are a good example. I think Xamarin in general doesn't want many people writing custom renderers right now. It's a very unpolished part of the product (most of my issues with Forms are in this area). If you do write custom renderers and rely on them heavily to get the results you want in your application then your experience with Forms is going to be much worse than someone who just sticks to what Forms can do out of the box. That will alter your perception of the platform. This is another thing that I think is overblown because it's consistent with the underlying platforms. Unless Fredy is equally vocal to Apple and Google with each new SDK release then I think he's being unfair. Every major iOS SDK introduces new annoying bugs and (intentional) changes in behavior, and I have to fix my app every time. At the same time, it seems that bugs I report in the iOS SDK are rarely if ever fixed. I see two differences between Apple and Xamarin in this respect: 1) Apple has almost no open communication with their developers (it's like a black box); 2) Apple releases major updates only once a year. The first one is clearly an advantage for Xamarin, but you wouldn't know it from this thread. The latter is both good and bad: we get new features and bug fixes more often, but with that comes breakages more often. It's a double-edged sword. I'm not convinced that having fewer releases would be better. Overall it just seems like nothing short of a miracle would satisfy some people in this thread. They seem to want releases with a huge number of bug fixes all at once with no new bugs. Software engineering doesn't work that way. We should know better. It's one thing to ask for improvements to regression testing (a very fair criticism), but it's quite another to pull out raw defect metrics with each release and complain that the absolute numbers aren't trending downward. That's not how it works. This probably underlines my inexperience in the field, but my frustration comes a subject your are highlighting. It seems like Xamarin.Forms walks this line of being called “stable” and “beta” simultaneously. There is a notable disparity between the presentation and reality of Xamarin.Forms. I think Xamarin in general doesn't want many people writing custom renderers right now. It's a very unpolished part of the product (most of my issues with Forms are in this area). If you do write custom renderers and rely on them heavily to get the results you want in your application then your experience with Forms is going to be much worse than someone who just sticks to what Forms can do out of the box. That will alter your perception of the platform. Create custom views. Create platform-specific views built with Xamarin.iOS or Xamarin.Android to customize the user interface on each platform. This seemingly contradicts what you are saying about custom renderers. If it is the case that we aren’t supposed to be using custom renderers or perhaps the word is “relying” on them, why is advertised as a prominent feature? Given your description and my experiences, it would be much more accurate to describe that as functionality that is "in-progress" or a “beta” feature. But it’s not presented that way. It’s presented as a selling point. "Works, but you shouldn't use it" doesn't seem like the description of a stable feature. Xamarin has tried to position Forms as a solution for simple enterprise/forms-based applications and proofs of concept, two use cases for which it is actually pretty reliable. Xamarin.Forms are written in C# and allow for rapid prototyping of applications that can evolve over time to complex applications. Because Xamarin.Form applications are native applications, they do not have the limitations of other toolkits such as browser sandboxing, limited APIs, or poor performance. This also means it is possible to create applications that will have parts of their user interface created with Xamarin.Forms while other parts are created using the native UI toolkit. The caveats that @adamkemp and others note about the platform are 100% apt and are incredibly useful to me when approaching Xamarin.Forms development. I’m really grateful for you and your work. But ultimately your accurate description of Xamarin.Forms is not the one that Xamarin uses and advertises. It’s one you’ve come to understand after experience and presumably wasting some time realizing that certain features do not work as described/advertised. Overall it just seems like nothing short of a miracle would satisfy some people in this thread. I didn’t get the impression that this thread wanted miracles––while enthusiastic and paranoid at times, I suspect most people here are voicing genuine frustrations and a desire to understand what we can actually expect from the Xamarin.Forms platform (with thoughtful recommendations for improvement to boot). I try to not get too worked up about these things, because at the end of the day I need to get my work done and don’t want to spend a whole day frustrated. The expression “It's a poor craftsman that blames his tools” comes to mind as well. Again, I really appreciate the critical response and the work you do throughout the forums and elsewhere @AdamKemp. I’m not well-versed in the distribution process differences between platforms so that’s an interesting point. Let me know if I’m way off-base about any of this. Ahh... I hope you do not mean it seriously...? And.. it's not only the number of bugs, it's also how updates are provided. I never had a problem of cause a bug in a new SDK release from Apple or Google (until now ), but I had various (partial vital) problems of cause Xamarin-Updates. Adam, I really respect you and your work for the community (thanks for that one more time) , but sometimes can't understand your thinking. Overall it just seems like nothing short of a miracle would satisfy some people in this thread. They seem to want releases with a huge number of bug fixes all at once with no new bugs. Software engineering doesn't work that way. No one expect a miracle, but every one expect a solid work for a paid product. I have bought a product for making app's and have to invest (really) more of my time for Xamarin problems as for developing my app. Xamarin should be simply a product to develop software on en efficient way (like e.g. VS). I own a small IT-company and the app is not for pleasure, but to generate income for my company. I work now over a year with XF and therefore can vote it with my own experience. So... the postings in this thread are definitely not "overblown". We (our company) just want an image button that works, better gesture support and stable releases. There is more but you get the idea. Through the 1.4.x cycle things improved significantly for release stability but things have regressed recently, I guess the additional hassle of UWP support (very important for us) is putting a strain on things. Stability is important as it affects the rate we get updates from our control vendors. A lot of this is about openness with the community. The 2.0 release hasn't been handled great and I don't blame the Forms team whatsoever, it looks management/marketing led. There's so much that is great about Forms and it's so well suited for enterprise cross platform and other scenarios, but it's hugely frustrating at times. I think we're entitled to a moan quite frankly. Again, this is simply not true. I have done plenty of criticizing Xamarin for stability and extensibility issues. I think it's really unfair to say that I always defend Xamarin. I'm honestly just trying to be fair, and I honestly don't think that Xamarin.Forms is being portrayed fairly in this thread. Part of that, again, is that I think some of you are stretching it beyond its intended uses. I don't want to criticize that (honestly, it's cool), but you should know that you're stretching it and set your expectations accordingly. If your app is more than a simple enterprise/forms-based app or a proof of concept then you're doing something more than what Forms is advertised to do. My experience is very different. Every single major iOS SDK release introduces bugs in our apps, and we don't feel comfortable shipping an update linked against a new SDK without doing a full run of our manual test suite (not everything can be automated). The same is true for Android, but we update it less often because it does less good. We pay a lot of the cost upfront for Android because each vendor has made enough modifications of the platform that we can't really trust that it behaves the same on any two devices. Both of these are examples of significant issues with stability across releases or across devices, and I don't think Xamarin is so much different from them that you should be singling them out. Again, I just honestly don't believe that's fair. I already pointed out why the raw number doesn't necessarily mean what you claim it means. I'm not going to repeat myself. New features. 2. Fewer bugs. Those two requests are at odds. I think one thing you could very fairly say about Xamarin is that they often try to do too much too quickly, which is what leads to lower stability. But you can't at the very same time ask for even more features. The Forms team is not that big. They can't both deliver new features and make drastic stability improvements. It seems like Xamarin.Forms walks this line of being called “stable” and “beta” simultaneously. I think that only makes sense if you consider "beta" to mean "smaller featureset". It's not yet a hugely powerful, build-anything kind of platform. Google might call it a "beta" for that reason. In terms of stability, though, in my opinion, when used for the simple applications that Xamarin had in mind when they designed (and named) it, it's stable enough to not be called a beta. Is it stable enough? I don't think so. But it's not alpha or beta quality for those use cases. I think most of the rest of your post is about whether my portrayal of Xamarin's positioning of Forms matches reality. I do think it's very fair to say that their marketing message is muddled at best. You can see the outline at least of what I'm claiming on the xamarin.com/forms page in the section about which approach is best. That's where they're trying to make it clear that if custom UI is important then Forms isn't the right approach. At the same time, they do make it possible to do custom UI, which is an advantage over similar products. I have gone back and forth with a few people at Xamarin about this mixed messaging and the damage I think it causes when leading people down the wrong path. The consistent message I have gotten from them directly is that Forms is appropriate for simple applications or proofs of concept, and repeatedly I have heard that they think that apps that rely heavily on custom renderers are probably not well suited for Forms. The fact that this is still not totally clear on their site is frustrating for me. I have tried to convince them that their documentation and marketing materials don't adequately convey that message, and I don't think I have been successful so far. The fact that these discussions still come up (and I can sense already @GeorgeCook preparing to adamantly defend the use of Xamarin.Forms for powerful, beautiful, performant UIs) is a sign that they haven't really made it clear enough what they think Forms should be used for. Long term I do think Forms could be a really powerful platform for building any application, but it's not there yet. We're going to have to be patient. Interesting thread here. I just noticed the release of 2.0 Jason posted this morning with updates including some feature, performance improvements and cell recycling. That was more than I was expecting. Yes, with an expensive product it's always good to keep expectations high. 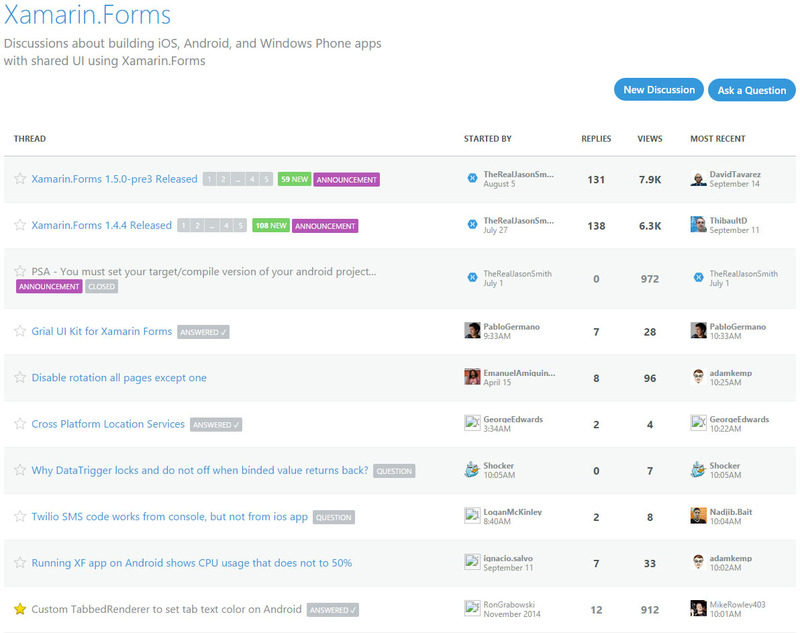 Keep pressure on Xamarin to keep on improving Forms, that's a great thing. Do I wish it was 10x better, yes most definitely, I wish it was faster and had a bunch more features and controls. Happy to support the community in voicing your concerns to Xamarin where I can. Personally I've learnt where Forms can provide value and where I can work around issues. The bug request is not new, people always ask for it on the forums (even today). The bug is open/reopened and has been for yonks. Gesture support is lacking but shouldn't be, probably has been the highest rated request on the uservoice wish list since 2014. I wouldn't class these as new features but features to rival existing products and something lacking from the basic offering. I push Forms actively and do my best to assist as I can see it's huge potential, it's just a one way street very often. Feel free to move this discussion offline as I have raised it repeatedly within Xamarin and I don't wish to undermine the discussions I've had internally. Communication - Still has lots of room for improvement. That will likely resolve ALOT of chatter. I always enjoy hearing from @MigueldeIcaza as well. Quality Control - I tend to stay away from the pre-releases given the random issues that appear. I know that by not testing my own app, its not helpful for the community, but I lose soo much time switching versions only to find issues that take time to debug. Performance - IE ListView, although this has been addressed in the latest release. I just haven't gotten around to upgrading, and will not until the bugs are worked out. iOS, Android and Windows - I must say I can understand why some of this stuff is so difficult to get right. All 3 platforms are continually evolving and I find it intense, yet kinda fun, just to keep up with everything. This Forum - The people in THIS forum, seriously are AMAZING! So many many thanks for your time and support. Its greatly appreciated. Customer Success Engineer - Whenever I reach out to my CSE I always get some type of response back, may not be what I want to hear but I get some form of communication back. Stability - For me, Xamarin.Forms has become very stable with the last 1.3-1.4 releases. I started using X.Forms a few months after release and it was very rough for at least the first year. Currently, I do not have any (known) outstanding bugs that will prevent me from going live. Maybe I will find out later after I go live and move forward with marketing, hopefully not. I do use Xamarin.UITest with Specflow to perform BDD testing, which is useful after updating to a new version. I also use Insights to track bugs. Both of which have become extremely helpful in preventing new bugs from creeping in. Custom Renderers - I think its a fantastic way to do things that the platform does not support. Not sure why it is not recommended by some. I do wish more people had similar experiences and I REALLY hope that after I go live I do not suddenly have crazy issues.